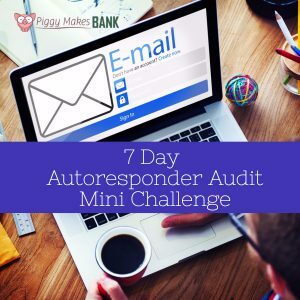 Our 7 Day Autoresponder Audit Mini Challenge is designed to give you a taste of our content and to help you to grow your list and inspire activity in your community. By far our favorite way to grow our reach and create engagement with our target audience in any niche is running a challenge. The idea is to post something on a topic each day for 7 days both on a blog, and on social media. In the content you share helpful tips and advice and to go along with it, emails go out each day that point readers to the new content and challenge them to follow along. With this mini content bundle, you challenge your readers to sign up for their own list, review each step of the process, and tweak and adjust along the way. By the end of the week, they have a revised and improved list building funnel that will serve their business for months and years to come. How Welcoming Is Your Welcome Email? Are Your Messages Serving You And Making You Money? Get this 7 Day Autoresponder Audit Mini-Challenge PLR Bundle PLUS BONUS for FREE- and Start Growing Your List Today!